THE HUMAN RACE is a powerful adventure documentary filmed against an ancient, remote and spectacular landscape. 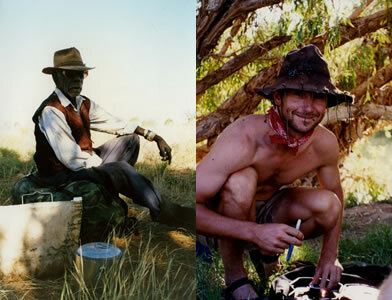 Three men set out against each other in a test of endurance, survival skills and tenacity as they walk more than 500 kilometres from the edge of the sun scorched desert to the tropical coast line. This film tells the story of – an Australian Aboriginal elder in his seventies who travels with little more than his Dreamtime knowledge and traditional bush skills; a famous German survival expert who, at sixty one, still spends his life taking himself to the limit of human endurance; and a young (mid -thirties) American ultra marathon runner who utilises many items of today’s advanced technology. The competitors’ only mode of transport is by foot. They walk for four weeks over red plateaux, mountains, rugged water courses and deserts, through some of Australia’s most inhospitable terrain. For ABC television, National Geographic and ZDF Germany. USA: Winner Human Spirit Award, Telluride. AUSTRALIA: Winner Best Cinematography AFI AWARDS, Australia.